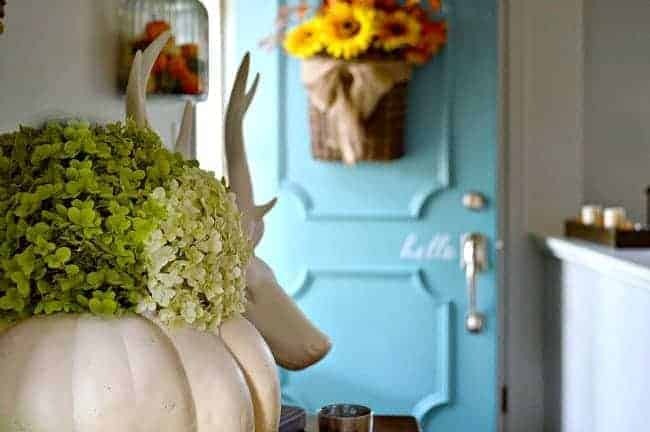 A quick and easy 10 minute DIY fall decor idea! I’m a quick and easy craft kind of girl. The perfect project for me is when I can sit down with a few supplies and do in a short amount of time. It doesn’t always work out that way, but today’s project definitely falls under the category of quick (in under 10 minutes) and easy, and I actually love the results. Perfect! 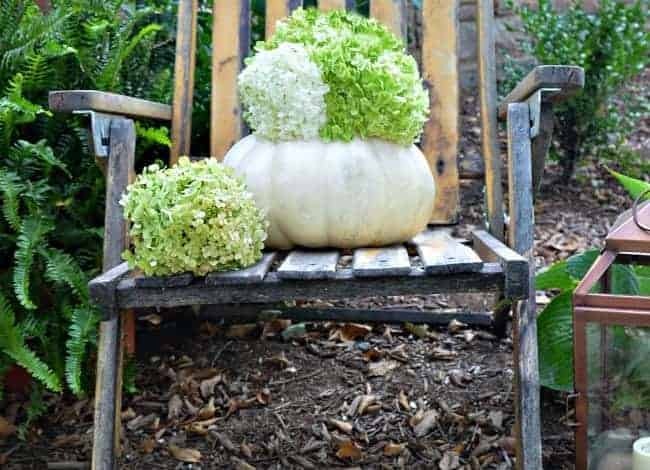 Last year I bought a few faux pumpkins for my front porch, I always like to add a few faux with the real ones. When I unpacked them this year, one had a stem that had been pulled out. 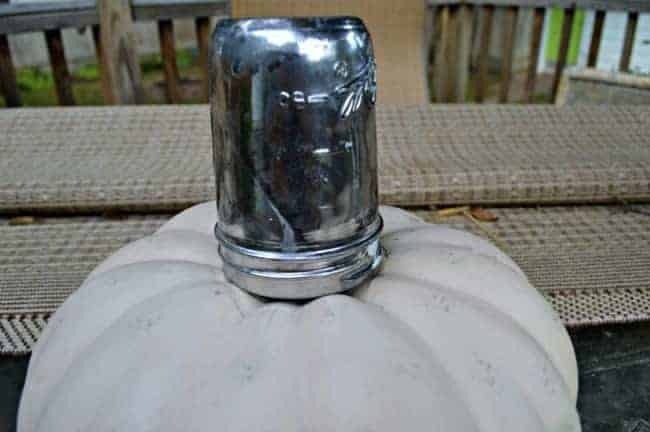 I thought about gluing it back on, but decided to try to make it into a pumpkin flower holder to add to my indoor fall decor. So, when I get an idea I just kind of just go for it with no real plan. Sometimes it works out, most of the time it doesn’t, but I’m happy to say that this one was a success! To start, I just removed the rest of the pumpkin stem. 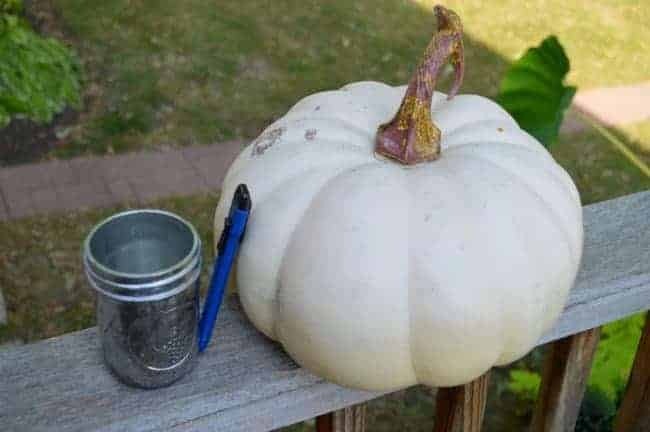 Then I put the mason jar on top of the pumpkin and traced it with a pencil to mark where I would cut. 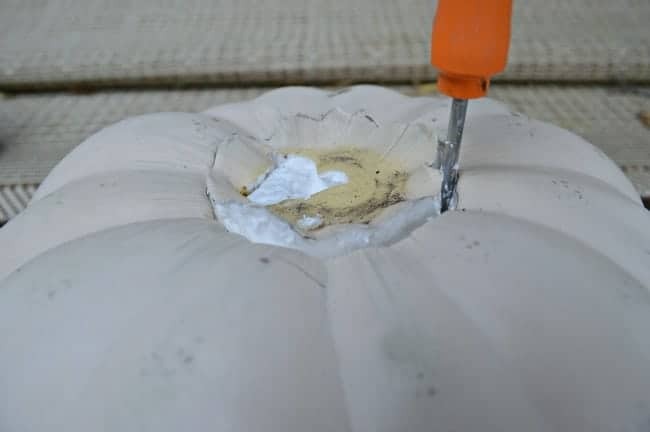 Next, I used the utility knife to cut out the top of the pumpkin. I went around the top a few times with the knife, and then I used a screw driver to loosen it up. I was able to pull the top out rather easily. 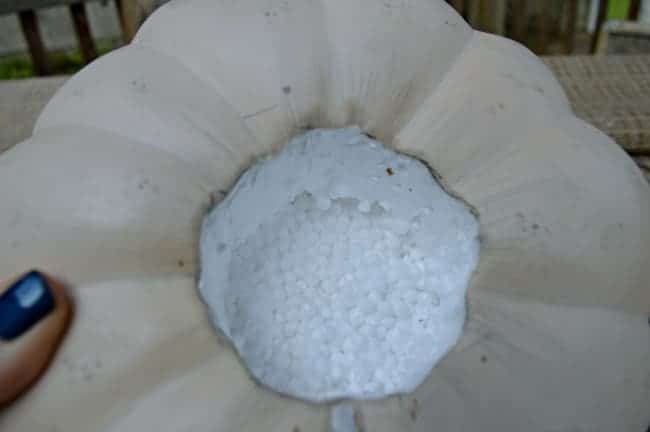 After I removed the top, I could see that the pumpkin was filled with styrofoam beads. I emptied some of them into the trash and inserted the small mason jar into the hole. All that was left to do was to add my flowers. A few weeks ago, I planted a couple of hydrangea in my front flowerbeds and still had some beautiful flowers. 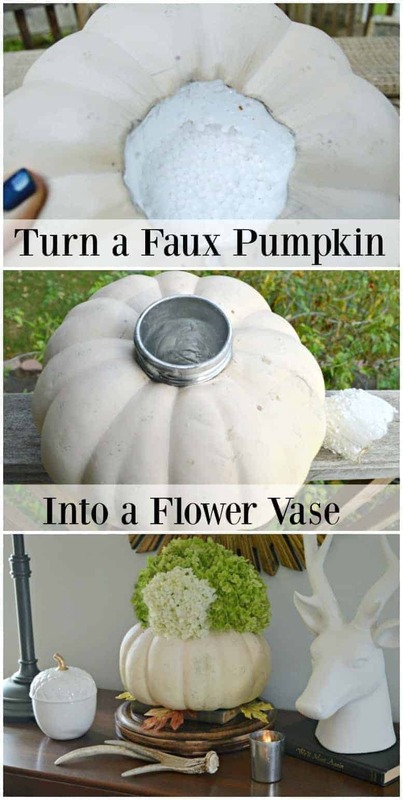 I just cut some off and added them to my faux pumpkin vase along with a little water. 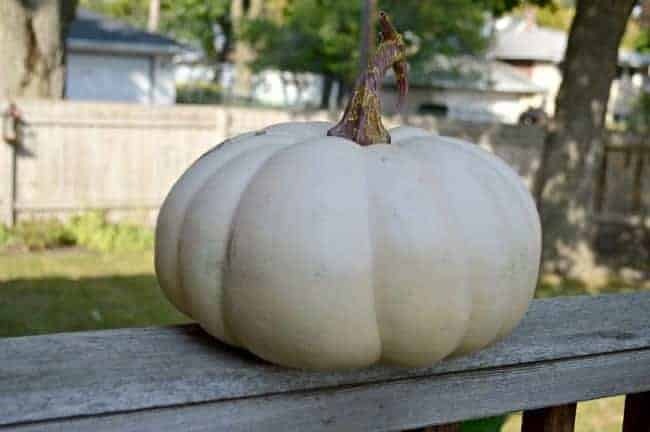 My husband even thought it was a real pumpkin. 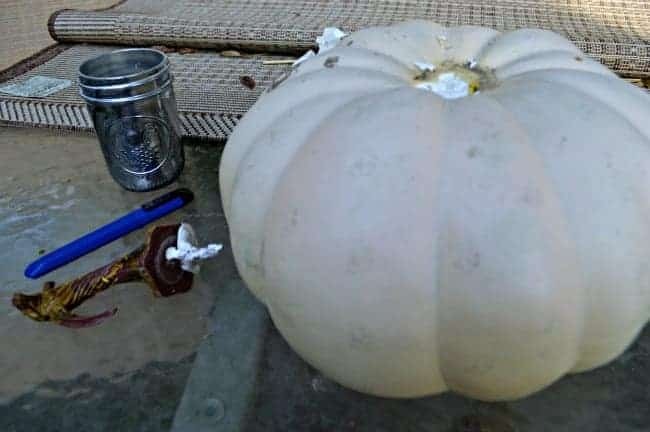 When I asked him to carry it inside for me so I could clean up my mess, he couldn’t believe that it I used a faux pumpkin. Then again, he also thought that I had just glued the flowers to the top of the pumpkin. 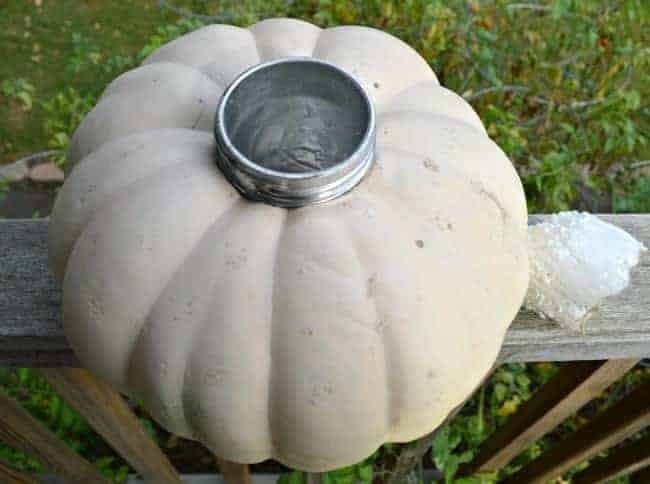 You could also do this project with a real pumpkin, too. 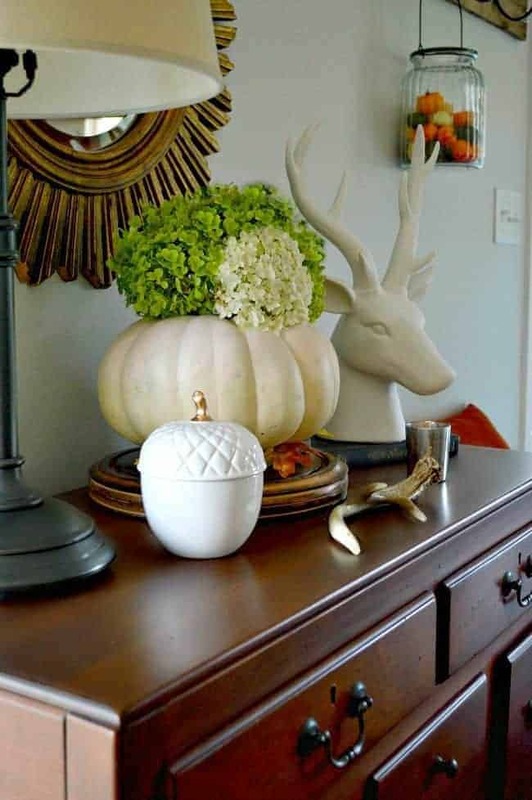 I like the faux because I like the idea that I can keep it out until Thanksgiving. You could even use different flowers. Quick and easy and, might I add… free. I already had all my supplies so all it cost me was about 10 minutes of my time. Are you a project planner or do you just go for it and hope for the best (like me 😉 )? I have more thrifty fall decor and DIY ideas if you want to check them out. Love how that looks, Kristi! Hi Kristi I just LOVE your creative pumkin idea!! 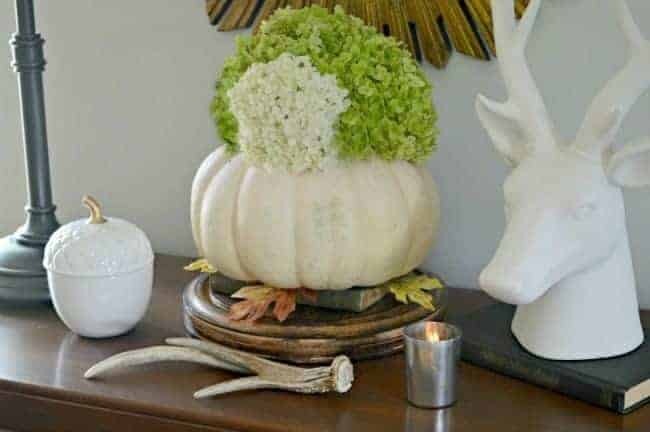 You could also fill the mason jar at Xmas time with candy canes and use a cute Xmas bow around them ; I think that would be soo cute and different and the white pumpkin would show up so well with the color red! Take care Sandee Fairfax Va. I saw your post when I was checking on my post for Metamorphosis Monday. I loved it. Great ideas. I enjoyed seeing this post. Thanks. Thanks Valerie! I appreciate your sweet comment, it totally made my night. 🙂 So glad you found me. So pretty with the hydrangeas. Nice idea. I did an orange pumpkin, but instead of fresh flowers, I glued a gold bow to the top, and then glued fall flowers into the bow with fall leaves at the base. In-fact, I taught a class using this at an independent living community. It was a hit. BTW I loved the hat you bought!! You look great in it. See ya Friday. Thanks Brenda! Sounds like you had a great idea with your pumpkin craft too. I bet it looks awesome! Very nice. But honestly, that’s the best looking faux pumpkin. Where did you get it? I know you said it was a year ago, but maybe I’ll get lucky! Love it Kristi! Looks real to me. Great idea! PS: You probably guessed right about my dogs name sake. My husband named him and he was a big Tim Tebow fan. P.S. I lived in Florida when Tebow was in school, so I figured that was why he had that name. Great name for a dog! This is awesome! It can have those flowers now, different ones for Thanksgiving, and do it all again next year (and after that again and again)! And they could be fake or real flowers even, since there’s the mason jar to hold water for them (for real ones, that is)! Thanks Jessica! Faux flowers, real flowers and maybe a bunch of lollipops (my husband would enjoy that one). I appreciate your visit. Hope you have a great week! Love that! I like mixing faux and real too, and now you’ve made me want to grab more faux ones! Thanks for your visit Nancy, and I hope your week is a great one!